I'd rather not dwell too much on the environment I have to deal with... It's a horribly shaped room, too much concrete, tiles on the floor and a ceiling that's partial concrete and partial gypsum. In the past it was even worse with a 'vide' that resembled a transmission line. I know, not good, but it's what I have to work with. I use a central Windows 10 based server (downstairs, in the storage) and have recently upgraded to an Atmos setup with a big flatscreen, coupled to an old Bluray player and a NVidia Shield mediaplayer. I haven't got the most fancy setup, but I'm fairly happy with it... You have to keep this in mind: all components were collected over time, and the aim was to have a good home theater setup without making concessions to 'normal' music. I don't have a dedicated room but have to settle for my (irregular shaped and acoustically horrible) living room. I tend to listen to music in a regular stereo setup (analogue 2 channels using only the front speakers, or digital 2.1 with the added subwoofer). To watch movies I use a 5.1.4 / 9.1 setup. Subwoofer, ceiling and rear speakers I use for effect, not for perfect accuracy. Tapedeck - Sony TCK-77ES - 20 years old?! This setup served me well until 2007, when quickly one after the other the Sony CD player and the Sony amplifier died on me. (Oh well, about 17 years of service, I shouldn't complain too much.) That cassettedeck is still working today! A Philips Ambilight television 42PF9831, which had a year long life as a showroom demo model before I bought it. Nice television, loads of inputs, and theoretically able to browse a network. Unfortunately it's not entirely full-HD, as it seems to do 1080i (interlaced), not 1080p (non-interlaced progressive scan). Haven't tested that yet. Why a Philips? Well, mostly because of the Ambilight. It takes a little while to get used to, and then you love it. At least I do. Buy a good quality HDMI cable, especially for longer distances, but don't go crazy. Forget those all-in-one boxes. If you go 'audiophile' it's easier to get to heaven using regular (older) 2 channel stuff! 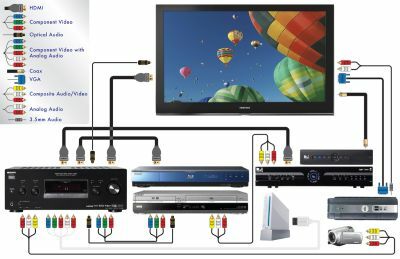 If you want to use the same setup for movies and music you will have to make some compromises, but any of the 'heavier' Sony / Denon / Onkyo / Yamaha / ... 5.1 or 7.1 receivers should do the job. I'm not sure if the DA1200ES lives up to the 'ES' nominator, but it's heavy enough to be considered a fair member :-) It doesn't feature all possible / modern high definition sound decoders, and I'm not entirely convinced it's full 7.1 but I cannot test because I simply don't have a 7.1 setup at home. Power wise it's a bit short on breath... 5x 100W isn't enough to drive real good high end speakers, but as I haven't got the money for those kind of speakers that doesn't hurt too much. Why not a 7.1 setup? Simple. My living room has the wrong shape, and I simply can't place the mid speakers anywhere. Perhaps I'll buy a pair of Jamo A510 flat speakers some day just to try. The DA1200ES offers good sound, but I've found out that I tend to switch off all digital enhancements, effects and what not, and simply play audio over the analogue inputs, bypassing anything digital. Update. I've bought (yet again at discount, as it was a discontinued older model) a new CD player. Now audio direct as well as digital with AFD-Auto sound good but not identical. As to be expected, the new CD player is analogue as well as digital a vast improvement. My ears and my kit simply are not good enough. I can hear the difference but can't figure out which one's better. Sorry. Three noteworthy aspects: 1. the self-adjusting calibration is pretty good, 2. night-mode actually works, and 3. do not trust the downmix quality when it comes to replacing elements of your 2.1 / 5.1 / 7.1 setup. My Sony started to produce some annoying transformer hum which I found no way to fix. I opted for a Marantz SR7011. Not as good as the Sony, but it allows me to try a little Atmos, and does support HDR, 4k, and the latest HDCP over each HDMI input. The speaker setup changed to 5.1.4 by adding four second hand ceiling speakers. When my old Sony broke down I used a JVC DVD player for a while as my CD player, but it wasn't very convincing. The subsequent IISonic DVD player / HDD recorder did a better job, analogue as well as digital, but still wasn't 'there'. At last, I decided to buy something decent. I've been reading up on CD players for months, and listened to a few in the different shops. Unfortunately, most shops are too noisy, and the few ones where you can listen at your convenience have a. way to good equipment, making my own kit sound awfully poor, and b. all too often carry only those models reserved for those with deep, very deep pockets. After six months or so I decided to buy a Cambridge. One of their cheaper models, but still pretty good. Then, on my way home, I decided to drop in at a local but very large large 'consumer electronics' outlet. They did sell old stock of Marantz CD players. They had different models, so I skipped the Cambridge shop, and drove on home, where I (again) poured many hours over CD player specs and reviews.. Insert appropriate sigh, I know. In they end I did buy one of those discontinued older Marantz models, the CD6002, and I've been very happy with it ever since. It's a superb player with digital and analogue outputs. A white one. What else can I say, except that I probably have the type / model number wrong :-) It doesn't do 4k though. If you need a cheap, capable native as well as upscaling 4k player consider an Xbox One S or a Sony X700. Haven't got either of them, but I am eyeing the Xbox..
Stay away from small speakers! (Yes, your wife is going to hate you.) Quality sound needs a decent volume. If you have to compromise on size, then at least treat yourself to a decent pair of front speakers, otherwise forget about music. When you're a movie buff then please note that a good 5.1 setup is always better than a mediocre 7.1 setup. 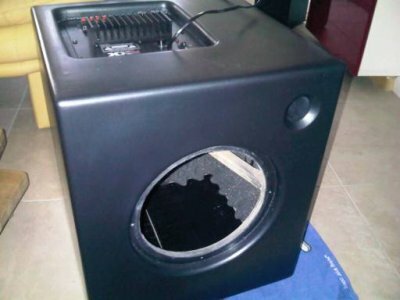 Subwoofers are a good add-on, but they cannot replace proper front speakers. Get yourself some decent cables. For speaker wires make sure the copper is thick enough. Again, steer clear of exotic stuff unless you like to waste money. Update. I've now upgraded to a pair of Mangat Magnasphere Lambda 10, of similar vintage. Somewhat affordable second hand, and they sound great for sound and for movies. Update: The old Vector 4 front speakers replaced the small Jamo's. Once you've got serious surround speakers you're not going to go back. Center speaker was a JBL CS55. It should be possible to create a proper downmix to be send to the television, but I could never get it quite right. As usual (do you sense a certain theme here?) I bought my center speaker at a discount. The JBL was partially chosen for the sound, as well as for its looks (it's similar in style to our television). Frankly, when I started looking for a center speaker (as the downmix issues showed the need for a real center speaker) I saw this one being advertised by a large discounter (same place I bought my Marantz CD player) and I immediately bought it because of the looks. I then realised that this wasn't exactly a smart move, so you can tell I was one hell of a happy camper when the center speaker sounded just right. Some people will find the center speaker (ie. my settings) a little overpowering, but I want to hear what the actors say, and not just guess at what they are saying. I admit this center might be a prime candidate for an upgrade though. I kept the JBL upstars. Downstairs I now have a second hand Mordaunt Short center speaker. Very cheap, as I got it as a freebee when I bought the ceiling speakers. Painted it black and it runs well enough. 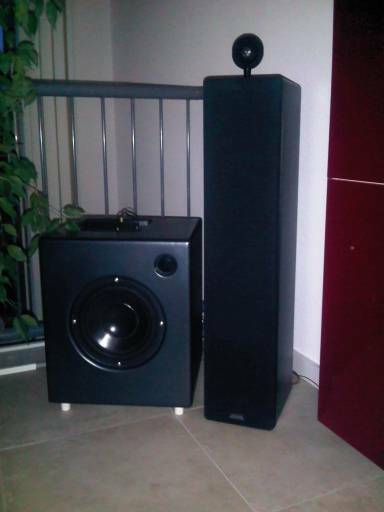 Finally the subwoofer: again an exotic, as it's home build :-) A second hand Vifa 25WN250 speaker (10 bucks, no kidding) and a cheap XXL amplifier module (40 bucks), all together in an MDF box (15 bucks). I'm not an expert on these things, but after some fooling around I ended up with a box of approx. 60 litres, bas reflex, and downfiring. The port is actually a little longer than calculations told me... in fact, I played a bit with this thing, facing, downfiring, and different lengths of reflex pipes, and in the end settled for a setup that 'sounded best'. (A very scientific method :-) but actually it's very close to the theoretical length) The box is downfiring, standing on rubber legs of approx. 70 mm. It has only a single brace, but (as you may be able to tell from the picture) all wals are made of fairly thick 22 mm MDF, the brace is 18 mm multiplex, and the Vifa driver isn't powerfull enough to cause any problems. Update 2010. 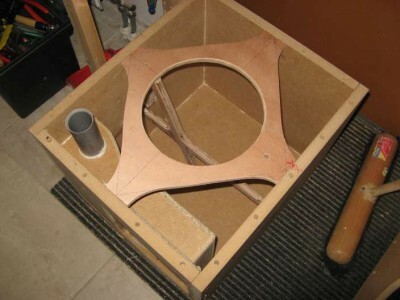 I still have to paint the thing :-) It seems the 'impact' of the subwoofer is slowly fading, for whatever reason. Less of a punch, more of a fill-in. Weird... It might be the speaker itself which isn't supposed to be used firing downwards. Just a few notes on (the use of and the need for) a subwoofer. My Magnat Vector 4 front speakers go down deep, and do that fairly well. I think they were supposed to pick up somewhere in the 30 or 40 hz range, but to get serious around 50 to 60 Hz. The label on the back claims 25 hz to 25 khz, but that's marketing talk. Anyway, when using test tones, there's nothing to be heard around 20 hz, but at 30 hz you can clearly 'feel' the woofers of the Magnat (front and surround) speakers moving. Literally 'feel' because, even though the drivers are moving, there's little in the way of 'sound'. 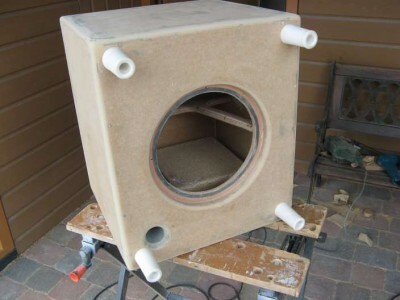 I've been trying the same test sounds with my homebuild subwoofer, which at first glance doesn't seem to do much more. But then at those low frequencies 'listening' is only half the story, you need to 'feel' that bass. On top of that, music is not a continuous test-tone, it a harmonic, chaotic mix of frequencies and amplitudes, and the (analogue) filters in the Magnat front speakers, as well as the digital filters in the amplifier may behave rather differently when confronted with the messy chaos that music is. In fact, the sub does add to the overall sound stage. When playing an analogue music CD over the analogue input, sound is clear, crisp, the soundstage is wide. Bass is clearly there. When playing that same CD in AFD, the subwoofer seems to be able to squeeze a bit more out of it, just at the bottom of the front speakers' range. Unfortunately, the amplifier's filtering is a little too aggressive, taking some bass away from the front speakers, even when those still have breathing space left. I might try to set all parameters manually to see if that helps, but I haven't explored all options yet. Movies are a whole different story. There this little (?) sub delivers. Do not expect an extreme heavy overpowering thud (the speaker simply isn't powerfull enough for that) but there is enough going on to make you feel (un)comfortable. All in all well worth the effort of building one. Can't you use your front speakers for that deep bass when your speakers are good enough? Yeah, you can. Or you could. But perhaps you should not. As every modern home theater setup has a dedicated subwoofer, and knowing the source of lower frequencies is harder to locate, and wifes tend to dislike larger speakers, many manufacturers have decreased the size of the front and surround speakers, moving more and more bass to the subwoofer. Unfortunately, they typically go too far, leaving you no other choice but to put the subwoofer in the center, below your screen, as it's getting too easy to locate. Obviously, manufacturing smaller speakers is cheaper, and small speakers are what the wife wants :-) Still admit it... they sound worse. Sorry. So, the physical subwoofer has nothing to do with the LFE channel, except that it is perhaps the most suitable speaker in your setup to handle low frequency sound, but that's about it. Wifi is a pain. Get yourself some CAT5e cable and start running them through your house for the best experience. Restrict Wifi to mobile devices such as an iPad. If you buy new equipment, buy Gigabit stuff. The price difference is marginal, and Gigabit makes copying lots of large files a bit more comfortable. Simplified: streaming puts the work on the server side, modifying data before it is send to the player. Sharing (or file serving) puts the work on the player side, with the server doing little. When dealing with 'light' devices, such as iPads, transcoding plus streaming is the ticket. When dealing with HTPC's and / or a NAS, sharing may be the better option. DLNA is a standard to allow devices to share their content across a home network. See http://www.dlna.org/home. UPNP allows different devices on a home network to exchange information without the user having to configure anything. UPNP-AV is an extension to that standard. Simplistically put, if your media device talks UPNP and / or DLNA there's a good chance it will work. That's good. Unfortunately, not all those devices play nice, and not all of them talk the same language. That's bad. Perhaps worst of all, all those applications and devices cannot seem to agree on a certain feature set. For example my Philips LCD television, the 42PF9831, cannot resize the screen / aspect when playing something from a UPnP server. That's silly. There are also some controls lacking, and if you look around on the Internet it seems that there is still a lot to be done: many players / devices do not support thumbnail previews, others can't properly fast forward, do not support all formats, do not properly identify themselves, and the list goes on. This makes DLNA / UPnP a lot less interesting, to be honest... And, to make things even better: the two terms are sometimes intermixed. Goody. If you got a home network with a server (Windows or something else) you could allow other devices to access the shared files on that media server. Pretty much it's using the SMB (AKA Samba) protocol. Of course, these devices have to talk the same protocol on both sides, meaning most (dumb) non-PC devices can't access these shares. If your server is a PC, and your HTPC is a PC, no problem. When using shares, the client (player) is actually accessing the files on the server, and it's the client that does the thinking. This is perhaps the easiest way, but the client needs to have the right software (codecs) to play whatever file is on the server. All intelligence is local. It does make sense to stay organised, see organize below for a few suggestions for possible paths and share names. Here the server is spoon feeding the data to the client. For this purpose some program is running on the server side, and some other program on the client side. There's intelligence on both sides (beyound normal file sharing) to make this work. Typically, this is used when watching movies in a browser, or listening to Internet radio stations. Clients can be a bit dumber but servers have to be a bit smarter. Quality may not always be the best possible once you deal with 'on the fly' conversions (AKA transcoding). Plex is a combination of a streaming application on the server side, as well as a proprietary client application on the client side. Works quite well, and is probably the easiest way to stream everything up to 4k and with 3D surround sound to your home cinema setup. I wouldn't worry too much about the client side (unless it is running 24/7, but then I'd suggest you get a life). The server, however, could make quite a bit of difference. Labtec 4.1 speakerset ? ? Dell 2210 22" widescreen ? ? ? ? 1. If you use a NAS, and media player without WOL, and you do not want to 'switch on' your NAS or server, you need to run that NAS 24 hours a day. This is pretty silly, even a SqueezeBox has a WOL, so why is there no such feature on most mediaplayers? 2. If you use a SqueezeBox player and you want snappy (web) response then take a Windows / Linux based server, or one of the more expensive NAS boxes (a cheap NAS is too sluggish in responding, causing lots of frustration). 3. If your server has to be able to transcode 'on the fly' (TVersity) consider at least an I3. Otherwise an Atom D510 will do fine. 4. If you use older hardware (P4, Amd 64, perhaps even the Athlon X2) you need WOL, without WOL you should consider upgrading to an I3. Note that there is a huge difference in power consumption between early and later incarnations of the I3. 5. Idle power is largely defined by (the efficiency of) the power supply and the mainboard, NOT the CPU (unfortunately documentation is often scarce, and who can afford buying multiple mainboards just to check on idle power consumption). 8. Consider one of those 'all in one' media players as well. Some of them come with a 2 TB drive, file sharing, torrent client, and more. It all comes down to costs vs. performance vs. requirements. Note that results on the Internet vary wildly. For example, some sites report the I3 idling at 40 W, others as idling at 90W though this may be due to the generation of I3, but sometimes it's hard to figure out. Sigh. Still, it seems the I3 is a safe choice if you want to do a bit more than just storage. Turns out power consumption can have quite the impact! Buy or build a machine suitable for your purpose. Pick the right CPU and consider power consumption. Get yourself a good power supply unit. I have been using two old laptops as HTPC's, a Dell Lattitude D510 and a Dell Lattitude D810. Just load XP on it, install XMBC for Windows and you're pretty much done. They won't run XBMC Live (well) due to missing graphic drivers. But an old laptop is not a real HTPC, and I'm perfectly aware of it. I've moved the physical side of things to the next page. A couple of years later the lack of codec support made it no longer a good solution, but it worked fine while it lasted. You've got two options: the using a PC running a software player, for example SoftSqueeze, SqueezeSlave or SqueezePlay (real men could try a Linux SqueezeSlave setup with a custom display). If you're not bying into the complete Apple universe, but still want to use that iPad you have to get fancy. Still, there's probably nothing better but an iPad to leisurely browse through your photo collection whilst relaxing on your couch... There's enough stuff on the web on setting up the client side. Check out this little list for the combinations and tools I tried or am using. The Apple alternative. Again, there's enough on the web for the client side. Check out this little list for the combinations and tools I tried or am using. More on the BB8900 here. Build a server, I used a virtual one which used IP 192.168.0.72. Install TVersity on it. The default port is 41952. Enable WiFi on your BlackBerry. Create a profile for your local WiFi network. Use either DHCP, or assign a fixed address to your BlackBerry using Options / Wifi Connections. Each IP address is related to a specific WiFi profile. On my home Wifi network I had no luck with DHCP so I set my 8900 to 192.168.0.32. Start the browser on your blackberry, chose Options / Browser Configuration / Browser and change to 'Hotspot browser'. Make sure to return your browser to 'Internet browser' (or in my case 'Web'n'walk browser' when you leave home and have no longer access to your own Wifi network). Hotspot browser - retrieves pages directly from the internet using the IP addresses set in your Wifi profile, using a DNS set by you. Web'n'walk browser - as above, but gets all DNS and some other information via your provider's servers. T-zones - makes the browser use WAP, and most operators will charge you using it. Unfortunately it sometimes gets selected for no appearent reason. Check and doublecheck and make sure this one isn't selected.